Despite the arrival of the Samsung Gear Sport, the Samsung Gear S3 is still one of the best smartwatches you can get your hands on right now. While it might be slim pickings on the app front, we've managed to pick out the ones S3 owners need in their lives and will actually find useful on a daily basis. Got any questions or thoughts about our selections? Hit us up in the comments section below. Sorry, Apple Watch owners, the Gear S3 is the only smartwatch with an official Spotify app to allow you to enjoy music from your wrist through Wi-Fi or LTE. You are free to browse through your playlists, charts and search for tracks on the app, with offline support for Android users also now in tow. This allows Premium users to listen to saved playlists even when not connected to an internet source. With Samsung only offering basic Strava support, the third-party options for exercisers isn't all that strong. 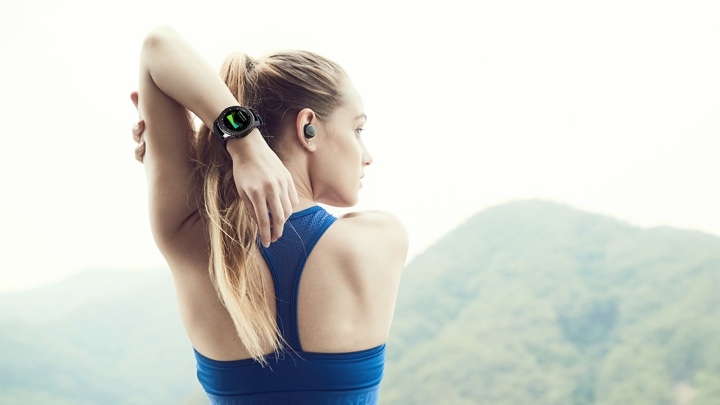 But with the recent Under Armour collaboration, the Gear S3 supports the Under Armour Connected Fitness suite - meaning you have access to apps like UA Record, MapMyRun, Endomondo, and MyFitnessPal. This not only gives you a bit more choice when it comes to how you want to enjoy untethered GPS tracking and route viewing, but you can also keep tabs on your diet, too. You know how it works by now, but the good news is that the S3's version of the cab-hailing app doesn't skimp on the features. The screen is big enough that dragging the marker to your chosen pickup location is easy, while the rotating bezel lets you zoom in and out of the map, and scroll through your choice of ride, be it a Pool, SUV or just a regular Uber X. It's the same deal as the S2 version - our favourite Uber smartwatch app around. Just be warned, this one is exclusive to those of you with Samsung phones. If you're all about watch faces, then this is a download essential. After flexing its customisation skills on Wear, Facer is available for Samsung's Tizen-running smartwatches. You can pick from over 15,000 different watch faces specially designed for the Gear S3 or you can have a go at creating your own through the Facer Creator portal where you can add in any images, pick different fonts, watch hands and drop in your favourite watch widgets. This allows users who own the Nest Learning Thermostat to monitor temperature, set the device status to 'home' or 'away' and even control the heat through the watch's rotating bezel. Nifty. You've taken the kids out to a theme park for the day. You left the car in car lot K, zone 4… you think. But it's dark now, the kids are cranky from their sugar comedown and you could spend days in this concrete hell. That is, unless you've used the Find my Car app, which marked the location when you arrived. You can also leave yourself a voice memo to remind yourself "Car is parked by red bollard" or "Never let the kids eat ice cream again". One of our recommended Gear S2 apps makes a return as a pre-installed app on the S3, and again, it's a bit of a surprise hit. You might not think watches were made for reading news, but Flipboard makes it work well, distilling stories down to the need-to-know facts. You can then tap a button to open the full story on your phone should you want to dig into the meat of it. Twist the Gear's bezel to navigate through a series of increasingly challenging labyrinths. The levels are vibrant, the gameplay will keep you hooked, and it's a great showcase of what the Gear S3 can do which rivals cannot. Glympse's function is simple: let people know where you are. Say you're meeting friends in an unknown part of town, simply send them your GPS location through the app and they'll be able to get to you. The Gear app simply lets you do it faster. You can also request a friend's location by tapping a different icon. We likey. Not the official version, but this replica is a surprisingly good fit on Samsung's watch, letting you command with a lot of precision. It can get a bit juddery now and then, but nothing that will spoil the endless fun of carving airborne watermelons. And it's free - fruity bonus. Sadly, the Nike+ app isn't likely to come to Gear due to Nike's partnership with Apple. To make matters worse, the selection of other running apps to choose from is woeful. Samsung Health isn't terrible, and is getting better, but if you want another option, Pear is free and works without your phone, offering audio coaching and tracking heart rate, distance and calories. The simplest app on our list, but quite a useful one. White Light turns your S3 into a mini torch by turning the display white and upping the brightness to max. Useful in a moment where you need some light and don't want to fish out your phone. Unless you're someone who sensibly carries a torch with them. Weirdo. Turn your S3 into a remote photo and video shooter. The app streams the image from either your phone's front or rear camera to your wrist, where you can remotely capture or set a timer. It also supports a flash mode. Running and listening to music is great, but sometimes you just want to feel like James Bond, right? Thankfully, if you're the owner of a compatible BMW vehicle, you can. The BMW Connected app allows you to lock/unlock doors, check how much fuel is left in the tank, view details of your next trip and, conveniently, check just where exactly the car is - all from your wrist. If you're going to download a maps app on your S3, we recommend this one as we find Google Maps a bit too fiddly on the watch. You can set a route and have it cache to your watch, so you can continue to use it without your phone later on. Handy. This one's free, but if it's navigation you're looking for, Mobiteka's paid Gear Navigator Standalone app may also be up your street. Get it? They should have just used a minimal version of android and implemented Tizen as a launcher so they could still have access to the play store = No app issue. Simple. The article shows it's been updated on May 28. I have seen the Tripcase app mentioned several times, but the standalone app for the watch no longer exist!, you can use Tripcase in your phone and get the normal notifications to be seen on the watch... but that's it! Can we connect samsung gear with other brands of mobile? Yes, I have my Gear S3 classic paired with my Motorola Z2 Play and it works very well. Very similar, if not identical to a Gear S3 paired with a Galaxy Note 8. I was on an OLD VZW plan, so I had to get a current plan. The watch works great on its own, away from my phone, on 4G. is there a UCONNECT APP to use with my jeep srt. That is the app on my smart phone to control my car.